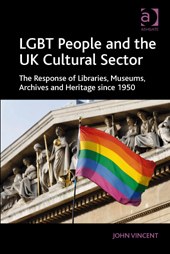 As well as participating in LGBT History Month, some cultural organisations also take part regularly in Pride events. LSE (the London School of Economics and Political Science) Library put on a display for 2014 of research resources from the Library. Norfolk: using the Historypin Connections project, Norfolk Library & Information Service are creating a community history archive of LGBT memories, and held a collecting session at the Norwich Millennium Library for Pride 2016.